(Pick-up) button: Press to go directly to the Phone screen or to answer an incoming call. (Hang-up) button: Press to end a call. (Talk) button: Press to call a number with a stored voice tag. (Back) button: Press to cancel a command. PHONE button: Press to go directly to the Phone screen. Selector knob: Rotate to select an item on the screen, then press . • Aim the vents away from the ceiling and close the windows, as noise coming from them may interfere with the microphone. • Press and release the button when you want to call a number using a stored voice tag. Speak clearly and naturally after a beep. • If the microphone picks up voices other than yours, the command may be misinterpreted. 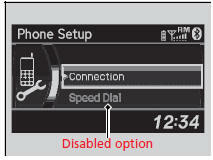 • To change the volume level, use the audio system's volume knob or the remote audio controls on the steering wheel. Certain manual functions are disabled or inoperable while the vehicle is in motion. You cannot select a grayed-out option until the vehicle is stopped. Only previously stored speed dial entries with voice tags can be called using voice commands while the vehicle is in motion. 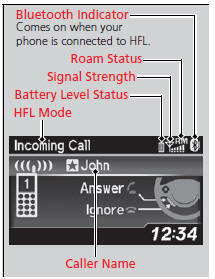 The information that appears on the audio/ information screen varies between phone models. You can change the system language to English, French, or Spanish.